Admire the scenic coastline of Roatan aboard the Jolly Roger Catamaran for a day of sailing and snorkeling. You'll be amazed to see the abundance of gorgeous marine life that inhabits this protected undersea paradise at the national marine reserve snorkel site. 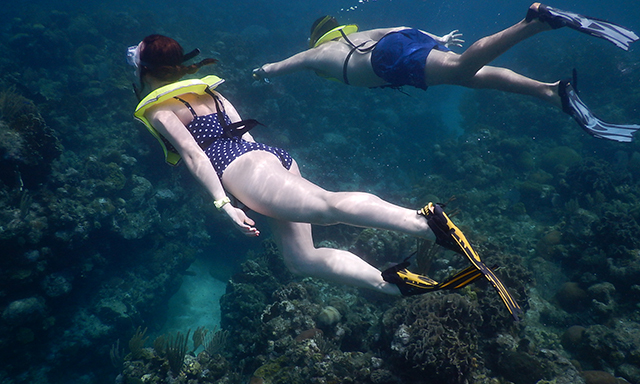 Enjoy an hour of exploration at a world-famous snorkeling destination. Fuel up with a flavorful buffet and listen to soothing sounds of Caribbean music as you sail back to port. • Jolly Roger Catamaran: Enjoy a peaceful sail along a scenic coastline on a luxurious vessel. • Snorkeling: Catch a glimpse of vibrant tropical undersea life at carefully chosen sites. • Buffet Lunch: Get your fill of food and drink while listening to the music of the islands. • Guests are required to wear a flotation vest at all times while in the water. • Guests will be divided into groups based on snorkeling and swimming abilities. • Each group will be assigned a snorkel guide.